On January 8, 2011, U.S. Representative Gabrielle Giffords and eighteen others were shot during a constituent meeting held in a supermarket parking lot in Casas Adobes, Arizona, in the Tucson metropolitan area. Six people died, including federal District Court Chief Judge John Roll; Gabe Zimmerman, one of Giffords' staffers; and a nine-year-old girl, Christina-Taylor Green. Giffords was holding the meeting, called "Congress on Your Corner", in the parking lot of a Safeway store when Jared Lee Loughner drew a pistol and shot her in the head before proceeding to fire on other people. One additional person was injured in the immediate aftermath of the shooting. News reports identified the target of the attack to be Giffords, a Democrat representing Arizona's 8th congressional district. She was shot through the head at point-blank range, and her medical condition was initially described as "critical". Loughner, a 22-year-old Tucson man who was fixated on Giffords, was arrested at the scene. Federal prosecutors filed five charges against him, including the attempted assassination of a member of Congress and the assassination of a federal judge. Loughner previously had been arrested (but not convicted) once on a minor drug charge and had been suspended by his college for disruptive behavior. Court filings include notes handwritten by Loughner indicating he planned to assassinate Giffords. Loughner did not cooperate with authorities, invoking his right to remain silent. He was held without bail and indicted on 49 counts. In January 2012, Loughner was found by a federal judge to be incompetent to stand trial based on two medical evaluations, which diagnosed him with paranoid schizophrenia. Judged still incompetent to stand trial on May 25, finally on August 7, Loughner had a hearing at which he was judged competent. He pleaded guilty to 19 counts, and in November 2012 was sentenced to life in prison. Following the shooting, American and international politicians expressed grief and condemnations. Gun control advocates pushed for increased restrictions on the sale of firearms and ammunition, specifically high-capacity magazines. Some commentators criticized the use of harsh political rhetoric in the United States, with a number blaming the political right wing for the shooting; in particular, Sarah Palin was criticized for a poster by her political action committee that featured stylized crosshairs on an electoral map. Palin rejected claims that she bore responsibility for the shooting, and others defended her by noting that Loughner hated all politicians regardless of their affiliation. President Barack Obama led a nationally televised memorial service on January 12, and other memorials took place. The shooting took place on January 8, 2011, at 10:10 a.m. MST (17:10 UTC). 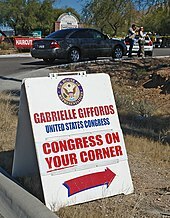 A United States Representative from Arizona, Gabrielle Giffords, was holding a constituent meeting called "Congress on Your Corner" at the Safeway supermarket in La Toscana Village mall, which is in Casas Adobes, an unincorporated area north of Tucson, Arizona. Giffords had set up a table outside the store and about 20 to 30 people were gathered around her when 22-year-old Jared Lee Loughner suddenly drew a pistol and shot Giffords in the head. The shooting was caught on video by a store security camera, but has not yet been released to the public. Loughner proceeded to fire apparently randomly at other members of the crowd. He was armed with a Glock 19 semi-automatic pistol with four magazines, two of which were capable of holding 33 rounds. A nearby store employee said he heard "15 to 20 gunshots". Loughner stopped to reload, but dropped the loaded magazine from his pocket to the sidewalk, from where bystander Patricia Maisch grabbed it. Another bystander clubbed the back of the assailant's head with a folding chair, injuring his elbow in the process, representing the fourteenth injury. Loughner was tackled to the ground by Bill Badger, a 74-year-old retired United States Army Colonel  who had also been shot himself. Loughner was further subdued by Maisch and bystanders Roger Sulzgeber and Joseph Zamudio. Zamudio, a concealed weapon (CCW) permit holder, had a weapon on his person, but arrived after the shooting had stopped and did not draw his firearm. Thirty-one shell casings were found at the scene by investigators. The first call from the scene to emergency services was received at 10:11 a.m. While waiting for help to arrive, Giffords' intern Daniel Hernández Jr. applied pressure to the gunshot wound on her forehead, and made sure she did not choke on her blood. Hernández was credited with saving Giffords' life. David and Nancy Bowman, a married doctor and nurse who were shopping in the store, immediately set up triage and attended to nine-year-old Christina-Taylor Green. Police arrived on the scene at 10:15 a.m., with paramedics arriving at 10:16 a.m. Badger observed the assailant attempting to discard a small bag containing money and identification, which was recovered by the officers. Following the shooting, the police shut down roads surrounding the shopping center until late in the day. The intersection was cordoned off and most of the businesses in the shopping center were closed throughout the weekend during the initial investigation. The Safeway store reopened a week later, with a makeshift memorial erected near the front of the store. Five people died at the scene, including Chief Judge John Roll and Giffords' community outreach director Gabe Zimmerman. Most of the injured were taken to University Medical Center in Tucson. Christina-Taylor Green was later pronounced dead on arrival at the hospital. When Loughner's parents arrived at their home, unaware of the shootings, they found police tape and police cars around their house. Their neighbor Wayne Smith said Loughner's mother "almost passed out right there", while his father sat in the road and cried. Smith described the family as "devastated", feeling guilty, and wondering "where did they fail?" Loughner's parents released a statement three days later expressing remorse for the victims and saying, "We don't understand why this happened." La Toscana Village mall. The attack occurred near the Safeway main entrance, which is below the gable-end. Jared Lee Loughner, the suspect, was described as a white male in his mid-20s with short hair and "dressed in a shabby manner". He was arrested after being detained by bystanders, and police later released his name and details. The FBI attempted to question Loughner, but he reportedly refused to cooperate with authorities and invoked his Fifth Amendment rights. Authorities said that Loughner's motive was unknown. They said that evidence seized from a safe in Loughner's home included an envelope marked with notes reading "I planned ahead", "My assassination", and "Giffords", as well as a letter from Giffords' office thanking him for attending a similar event in 2007. Federal officials charged Loughner the next day with killing federal government employees, attempting to assassinate a member of Congress and attempting to kill federal employees. Police reports reveal he had purchased a Glock pistol at a Sportsman's Warehouse store, after passing the required FBI background check, less than six weeks before and attempted to buy additional ammunition for the pistol at a Walmart on the morning of the shooting, but the clerk refused to sell it to him based on his appearance and demeanor. As the shooting occurred outside the Tucson city limits in unincorporated Casas Adobes, the Pima County Sheriff's Department started the initial investigation with assistance from the Tucson Police Department and the Arizona Department of Public Safety. The Federal Bureau of Investigation director Robert Mueller was ordered to the location by President Obama, and the FBI took over the investigation. The United States Capitol Police also conducted an investigation. Jared Lee Loughner, then age 22, lived with his parents Randy and Amy Loughner in Tucson, about 5 miles (8.0 km) from the site of the shooting. His mother worked for the City Parks Department; his father's work was not known. Loughner had been attending Pima Community College. Former classmates stated Loughner (at the time) cared about his education due to his appreciation of knowledge. Because of teacher and student complaints about Loughner's increasingly disruptive behavior in classes, the college suspended him on September 29, 2010, and he dropped out of the school in October. Loughner chose not to return, as the college required him to have a mental health evaluation and clearance to be readmitted. Before the shooting, Loughner had two previous offenses, one of which was for drug possession. He had become obsessed with Giffords, and had previously met her at a "Congress on your Corner" event in a Tucson mall in August 2007. U.S. Army officials said that Loughner had attempted to enlist in 2008, but his application had been rejected as "unqualified" for service. They declined further disclosure due to confidentiality rules. An administration official indicated to the media that Loughner had failed a drug test. Loughner had been posting material online for some time via his Myspace account and on YouTube under the name "Classitup10". He gave his views on terrorism, federal laws, and his belief that the government was brainwashing the citizenry with language. Hours before the incident, Loughner's Myspace page was updated with posts from his account stating, "Goodbye", and said to friends: "Please don't be mad at me." On November 30, 2010 Loughner purchased a Glock 19 semi-automatic pistol at a Sportsman's Warehouse store in Tucson, passing a background check. Earlier on the day of the shooting, Loughner reportedly had an altercation with his father regarding a black bag the younger man took from a car trunk. A bag matching the description was later found in a nearby desert area containing 9mm ammunition, and it is believed to belong to Loughner. Later that morning, at approximately 7:30 a.m., Loughner was stopped by an Arizona Game and Fish Department officer after running a red light, but was released with a reminder when it was determined that he did not have any outstanding warrants. Loughner was held in the Federal Correctional Institution at Phoenix without bail. All Arizona-based federal judges recused themselves from the case because of their ties to Judge Roll, who was killed in the attack. The federal case was assigned to a San Diego-based jurist, federal Judge Larry Alan Burns from the United States District Court for the Southern District of California. The public defender Judy Clarke, also based in San Diego, was appointed to represent Loughner in federal court. On January 19, 2011, a federal grand jury handed down an indictment for three counts against Loughner for the attempt to assassinate Representative Giffords, and attempting to kill two federal employees, her aides Ron Barber and Pamela Simon. Loughner was indicted on additional charges of murder and attempted murder on March 3, for a total of 49 counts. Prosecutors representing the state of Arizona filed murder and attempted murder charges on behalf of the victims who were not federal employees. Under Arizona's speedy trial statutes, Arizona state prosecutors normally have ten days from the time a suspect is taken into custody to file charges, but time spent in federal custody does not count toward this limitation. Conviction in either federal or state court meant that Loughner could face the death penalty. On May 25, 2011, Judge Burns found Loughner incompetent to stand trial based on two medical evaluations. These had diagnosed him as suffering from paranoid schizophrenia. Loughner was ordered to be forcibly medicated following his diagnosis of schizophrenia. A new evaluation was ordered for January 25, 2012. On February 6, 2012, his stay at the Springfield, Missouri facility was extended by four months. A request by Loughner's lawyers to end forced medication was denied. Another competency hearing was set for June 27, 2012 but later rescheduled. On August 7, 2012, Loughner's competency hearing began with testimony from Dr. Christina Pietz, Loughner's forensic psychologist, who testified that she believed Loughner was competent to stand trial. After hearing the evidence, Judge Burns ruled that Loughner was competent to stand trial, whereupon Loughner pleaded guilty to 19 counts, sparing himself the death penalty. On November 8, 2012, Loughner appeared for sentencing, with several of his victims as well as relatives of those he killed in attendance. Judge Burns sentenced Loughner to seven consecutive life terms plus 140 years in prison without parole. After his sentencing in federal court, Pima County Attorney Barbara LaWall announced that she would not prosecute Loughner on behalf of the state of Arizona. LaWall explained that her decision would afford the victims and their families, as well as the community in Tucson and Pima County, an opportunity to move forward with their lives. She said that, after speaking and consulting personally with each of the surviving victims and with the family members of those killed, it was clear that they would not be benefitted by a state prosecution. Surviving victims and family members told LaWall that they are "completely satisfied with the federal prosecution", that "justice has been served", and that the federal sentence is "suitably severe". Christina-Taylor Green, 9, of Tucson. Green was accompanied to the meeting by neighbor Susan Hileman. As her date of birth was September 11, 2001, she had appeared in the book Faces of Hope: Babies Born on 9/11 (page 41). She was the granddaughter of former Major League Baseball player and manager Dallas Green and the second cousin of actress Sophia Bush. Dorothy "Dot" Morris, 76, a retired secretary from Oro Valley; wife of George, who was wounded. John Roll, 63, chief judge of the U.S. District Court for Arizona, named to the federal bench by President George H. W. Bush in 1991. Phyllis Schneck, 79, homemaker from Tucson. Dorwan Stoddard, 76, retired construction worker, died from a gunshot wound to the head; his wife Mavy was wounded. Gabriel "Gabe" Zimmerman, 30, community outreach director for Giffords, and a member of Giffords' staff since 2006. Zimmerman was the first Congressional staffer killed in the line of duty. In addition to the six dead, thirteen other people were wounded by gunshot in the attack, while a fourteenth person was injured subduing Loughner. Gabrielle Giffords and two other members of her staff were among the surviving gunshot victims. Staffer Ron Barber, shot in the thigh and face, would later succeed Giffords in her House seat. 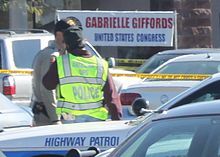 Gabrielle Giffords was reported to be the target of the shootings. Some news organizations initially reported that she had been killed, but these statements were quickly revised to reflect that she had survived with a gunshot wound to the head. Daniel Hernandez Jr., one of Giffords's interns, assisted her after she was wounded and is credited with saving her life. Giffords was taken to University Medical Center in critical condition, although she was still conscious. Within 38 minutes, Giffords underwent emergency surgery, and part of her skull was removed to prevent further brain damage caused by swelling. She was placed into a medically induced coma to allow her brain to rest. During a memorial ceremony on January 12, President Obama announced that earlier that day Giffords had opened her eyes for the first time since the attack. As Giffords' status improved, she began simple physical therapy and music therapy. On January 21, 2011, less than two weeks after the attack, her condition was deemed sufficiently stable for her to be released to Houston's Memorial Hermann Medical Center. A few days later she was moved to the center's Institute for Rehabilitation and Research to undergo a program of physical therapy and rehabilitation. After examination, her Houston doctors were optimistic, saying she has "great rehabilitation potential". Medical experts expect Giffords's recovery to take from several months to more than one year. On August 1, 2011, she made her first public appearance on the House floor to vote in favor of raising the debt limit ceiling. She was met with a standing ovation and accolades from her fellow members of Congress. Giffords engaged in intensive rehabilitation treatments in Asheville, North Carolina from October 25 through November 4. In 2011, Mark Kelly, Giffords' husband, published a memoir, Gabby: A Story of Courage and Hope, crediting her with joint authorship. He wrote that Giffords vows to return to Congress, although she continues to struggle with language and has lost 50 percent of her vision in both eyes. On January 22, 2012, Giffords announced that she would resign from her congressional seat in order to concentrate on her recovery, but promised to return to public service in the future. She submitted her resignation on January 25 on the floor of the House in an emotional appearance; colleagues and the House leadership offered their tributes to her courage and strength. In the wake of the shooting, Democrats and Republicans both called for a cooling of political rhetoric and a return to bipartisanship. On the eve of the shooting, Giffords had written to a Republican friend, Trey Grayson, Secretary of State of Kentucky, saying, "we need to figure out how to tone our rhetoric and partisanship down." In March 2010, Giffords had expressed concern about the use of crosshairs on a national midterm election map on Sarah Palin's campaign webpage denoting targeted congressional seats, including Giffords's, in Arizona's 8th district. Shortly after the map's posting and the subsequent vandalizing of her office that month, Giffords said, "We're in Sarah Palin's 'targeted' list, but the thing is that the way she has it depicted, we're in the crosshairs of a gun sight over our district. When people do that, they've got to realize that there are consequences to that action." At that point in the interview, however, the interviewer said, "campaign rhetoric and war rhetoric have been interchangeable for years." The image was removed from Palin's "takebackthe20" website following the January shootings. Palin responded to her critics in a January 12 video, rejecting the notion that anyone other than the gunman could bear any responsibility for the Tucson shooting, and accusing the press of manufacturing a "blood libel" to blame her and the right wing for the attacks. The political climate in the United States and in Arizona in particular was pointed to by some observers as a possible contributing factor for the violent act. For example, Clarence Dupnik, Pima County Sheriff, initially expressed concern that overheated political rhetoric and violence may be related, observing, "When you look at unbalanced people, how they respond to the vitriol that comes out of certain mouths about tearing down the government. The anger, the hatred, the bigotry that goes on in this country is getting to be outrageous." He believed that Arizona had unfortunately become "the capital" of such feelings. "We have become the mecca for prejudice and bigotry," he said. But, Dupnik later said that he had no evidence that the killings were a result of anything particular which Loughner may have read or heard. International media referred to the political climate in the United States and the Palin map in particular. The French newspaper Le Monde said that the attack seemed to confirm "an alarming premonition that has been gaining momentum for a long time: that the verbal and symbolic violence that the most radical right-wing opponents have used in their clash with the Obama administration would at some point lead to tragic physical violence." President Obama called the shooting an "unspeakable tragedy", adding that "such a senseless and terrible act of violence has no place in a free society". Arizona Governor Jan Brewer called the attack "senseless and cruel violence" and House Speaker John Boehner said, "An attack on one who serves is an attack on all who serve. Acts and threats of violence against public officials have no place in our society". Chief Justice John Roberts issued a statement noting, "we in the judiciary have suffered the terrible loss of one of our own", with the death of Chief Judge John Roll. Political figures such as Arizona's United States Senators Jon Kyl and John McCain, House Majority Leader Eric Cantor, House Minority Leader Nancy Pelosi issued statements. Numerous foreign politicians additionally commented on the shooting, including Canadian Foreign Affairs Minister Lawrence Cannon, British Prime Minister David Cameron, Spanish Prime Minister José Luis Rodríguez Zapatero, and Cuba's Fidel Castro. The website GiffordsIsLying.com, run by Giffords' former opponent Jesse Kelly, was replaced with a single page urging support for Giffords and her family. Senator Chuck Schumer called for a fresh look at gun control laws in the United States, including the possibility of high-capacity magazine ban, and prohibiting a person who has been rejected for military service due to drug use from owning a gun. Homeland Security Committee chairman Peter T. King announced that he would introduce a bill to ban the carrying of firearms within 1,000 feet (300 m) of certain federal officials. Representative Carolyn McCarthy announced that she would introduce legislation to ban the sale of high-capacity magazines to civilians. Some media commentators, such as Howard Kurtz and Toby Harnden, criticized what they perceived as a rush to judgment about the shooter's motivation, disputing suggestions that the shooting was the result of the Tea Party movement or anything in connection to Palin. Paul Krugman wrote an op-ed piece arguing that political rhetoric had become toxic. With renewed calls to tone down political rhetoric after the shooting, Keith Olbermann said, "Violence, or the threat of violence, has no place in our Democracy, and I apologize for and repudiate any act or any thing in my past that may have even inadvertently encouraged violence." Jon Stewart stated that he did not know whether or not the political environment contributed to the shooting, but, "For all the hyperbole and vitriol that's become a part of our political process—when the reality of that rhetoric, when actions match the disturbing nature of words, we haven't lost our capacity to be horrified. ... Maybe it helps us to remember to match our rhetoric with reality more often." U.S. flags flown by the federal government were displayed at half-staff from January 9, 2011 until sunset on January 15, 2011 in honor of the victims of the Tucson shooting. A national moment of silence was held at 11:00 a.m. EST on January 10, 2011 on the South Lawn of the White House as well as the steps of the United States Capitol. President Obama went to Tucson on January 12 where he met with the families of the victims and visited Giffords at her bedside in the medical center before attending the evening's televised memorial ceremony where he delivered a memorial speech. Among other memorials: when the Safeway store reopened after the shooting, the staff erected a makeshift memorial; at the 2011 Major League Baseball All-Star Game, Giffords' intern, Daniel Hernandez Jr., was accompanied onto the field by the families of the shooting victims, and threw the ceremonial first pitch; and for the 2011 State of the Union Address, Senator Mark Udall of Colorado proposed that members of both houses sit together regardless of party, with one seat left empty in honor of Giffords. Christina-Taylor Green, the youngest of the victims, had an interest in politics and said that she had wanted to attend college at Penn State University; she was born in Pennsylvania and had a connection to the state through her grandfather, Dallas Green. The university honored her with a brick on the Alumni Walk on campus, and with a certificate in her memory. On the night of January 11, 2011, Governor Brewer signed emergency legislation to prohibit protests within 300 feet (91 m) of any funeral services, in response to an announcement by the Westboro Baptist Church that it planned to picket the funeral of shooting victim Christina-Taylor Green. The members of the congregation agreed to appear on talk radio in exchange for dropping their plans to picket the funeral. On Sunday, January 16, 2011, eight days after the shooting, Vietnam War veteran James Eric Fuller, who had been shot in the knee during the attack, was arrested for disorderly conduct at a town hall meeting. After Tucson Tea Party figure Trent Humphries, who had faulted Giffords for not having enough security, stated that gun control measures should not be discussed until all those killed in the shooting were buried, Fuller allegedly took a picture of Humphries and shouted, "You're dead." In an interview during the week after the shooting, Fuller had criticized Palin and what he called the "Tea Party crime-syndicate" for promoting a divisive political climate before the attacks. The police then committed him to an undisclosed medical facility to undergo a psychiatric evaluation. A police spokesman stated that the hospital will determine when he will be released. Meanwhile, Humphries said he was worried about Fuller's threat, and the dozens of other angry e-mails he received from people blaming right-wing political rhetoric for contributing to the assassination attempt on Giffords. ^ Grimaldi, James V.; Kunkle, Fredrick (January 9, 2011). "Gun used in Tucson was purchased legally; Arizona laws among most lax in nation". The Washington Post. Retrieved July 26, 2018. ^ Kim, Susanna (January 11, 2011). "Glock 19: How did Unemployed Jared Loughner Buy Popular, Expensive Pistol?". ABC News. Retrieved July 26, 2018. ^ Feldmann, Linda (January 10, 2011). "Why Jared Loughner was allowed to buy a gun". The Christian Science Monitor. Retrieved July 26, 2018. ^ a b Horwitz, Sari; Hedgpeth, Dana; Fahrenthold, David (January 12, 2011). "Investigators probe Loughner's gun purchase, examine finances". The Washington Post. Retrieved July 25, 2018. The investigators believe that Loughner, 22, did not have sufficient income of his own to buy the Glock 19 semiautomatic handgun, the four magazines and the knife he allegedly carried to the event in front of a Tucson supermarket, the sources said. They estimated the cost at close to $1,000. Two of the magazines were extended ones capable of holding up to 33 rounds. ^ a b Montopoli, Brian (January 12, 2011). "Will Tucson Tragedy Shift Gun Control Debate?". CBS News. Retrieved July 26, 2018. What they have spent less time discussing are the tools that allowed Loughner to allegedly carry out the attack - the high powered weapon and ammunition that helped him do so much damage so quickly. Arizona has some of the laxest gun laws in the nation, laws that allowed Loughner to purchase and carry a Glock 19 9mm semi-automatic pistol - and high-capacity clips - despite the fact that he was barred from his community college campus because administrators saw him as a mentally-unstable security threat...The clip allegedly used by Loughner, which allows for 33 shots without reloading instead of about 10 in a normal clip, would have been illegal under the assault weapons ban that Congress let expire in 2004. ^ a b c d "Arizona Congresswoman Giffords shot; doctors 'optimistic' about recovery chances". The Arizona Republic. January 8, 2011. Retrieved January 12, 2011. ^ a b c d e f g h i Lacey, Marc; David M. Herszenhorn (January 9, 2011). "In Attack's Wake, Political Repercussions". The New York Times. ISSN 0362-4331. Archived from the original on January 10, 2011. Retrieved January 12, 2011. ^ a b c d e f g "Police 'actively pursuing' second person in Tucson shooting". CNN. January 8, 2011. Retrieved January 8, 2011. ^ a b c "Criminal Complaint Against Jared Lee Loughner". The New York Times. ^ a b Couric, Katie (January 10, 2011). "Strangers Linked by Tragedy in Tucson Rampage". CBS News. Archived from the original on February 9, 2011. Retrieved January 11, 2011. ^ a b Bell, Melissa; Buck, James (January 14, 2011). "Updated: List of injured victims in Arizona shooting released by Pima County sheriff". The Washington Post. Retrieved January 14, 2011. ^ Kanalley, Craig (January 8, 2011). "Jared Lee Loughner Identified As Gabrielle Giffords Shooter". Huffington Post. Archived from the original on January 11, 2011. Retrieved January 13, 2011. ^ a b c "Suspect in Arizona massacre: 'I planned ahead'". Chicago Sun-Times. Associated Press. January 10, 2011. Retrieved January 14, 2011. ^ a b Lacey, Marc (January 9, 2011). "Evidence Points to Methodical Planning". The New York Times. ISSN 0362-4331. Archived from the original on September 4, 2011. Retrieved January 11, 2011. ^ "Jared Lee Loughner, suspect in Gabrielle Giffords shooting, had college run-ins" azcentral.com, January 9, 2011. Retrieved January 23, 2014. ^ a b "Judge: Loughner not competent to stand trial in Arizona shootings". CNN. May 25, 2011. Archived from the original on May 27, 2011. Retrieved May 25, 2011. ^ a b Tom Cohen (January 17, 2011). "Democrats face tough fight on gun control after Tucson shootings". CNN. Archived from the original on January 21, 2011. Retrieved January 23, 2011. ^ a b Przybyla, Heidi (January 10, 2011). "Giffords Shooting in Arizona May Cool U.S. Political Rhetoric, Hurt Palin". Bloomberg. Archived from the original on January 10, 2011. Retrieved January 9, 2011. ^ a b Gillum, Jack (January 16, 2011). "Timeline shows Loughner's actions hours before arrest". USA Today. Retrieved January 14, 2011. ^ a b Richard A. Oppel Jr. (January 18, 2011). "Video Captured 'Calculated' Gunman in Tucson". The New York Times. Archived from the original on January 19, 2011. Retrieved January 18, 2011. ^ a b Dolnick, Sam (January 12, 2011). "Flashbacks and Lingering Questions for Survivors". The New York Times. ISSN 0362-4331. Archived from the original on January 13, 2011. Retrieved January 13, 2011. ^ "Routine event turned deadly fast". Star Tribune. Minneapolis – Saint Paul. Los Angeles Times, The New York Times. January 10, 2011. Archived from the original on October 15, 2012. Retrieved January 11, 2011. She and an aide parked an SUV in the lot of La Toscana Village, a mall about 8 miles north of downtown Tucson. ^ Alltucker, Ken (January 12, 2011). "Obama visits Giffords at hospital, leaves for speech on campus". The Arizona Republic. Retrieved January 12, 2011. ^ Lacey, Marc; Williams, Timothy (January 13, 2011). "Doctors Call Giffords's Progress Remarkable". The New York Times. Retrieved January 16, 2011. ^ David Nakamura; Dana Hedgpeth; Sari Horwitz (January 19, 2011). "Videos show details of Tucson shooting". The Washington Post. Retrieved January 19, 2011. ^ a b Quinn, Ben; Gallagher, Paul (January 9, 2011). "US congresswoman Gabrielle Giffords shot as six die in Arizona massacre". The Guardian. London. Archived from the original on January 15, 2011. Retrieved January 13, 2011. ^ Barrett, Paul M. (January 13, 2011). "Glock: America's Gun". Bloomberg Businessweek. Bloomberg L.P.
^ DeGregory, Lane (January 14, 2011). "Little surprise that popular Glock 19 was used in Arizona shooting". St. Petersburg Times. Archived from the original on October 14, 2012. Retrieved January 14, 2011. ^ Karni, Annie (January 9, 2011). "Terror, then eerie calm as victims fall". New York Post. Retrieved January 14, 2011. ^ "Congresswoman's responses after Arizona shooting called encouraging". CNN. January 9, 2011. Archived from the original on July 17, 2012. Retrieved January 19, 2011. ^ Hopper, Jessica; Dolak, Kevin; Sher, Lauren (January 10, 2011). "Heroes of Tucson Shooting: 'Something Had to Be Done'". ABC News. Archived from the original on January 19, 2011. Retrieved January 15, 2011. ^ Renie Workman (January 10, 2011). "Man who Tackled AZ Gunman has Schuylkill County Ties". WNEP-TV. Archived from the original on March 15, 2012. Retrieved January 10, 2011. ^ Dolak, Kevin; Weaver, Justin (January 9, 2011). "Woman Wrestled Fresh Ammo Clip From Tucson Shooter as He Tried to Reload". ABC News. Archived from the original on January 19, 2011. Retrieved January 10, 2011. ^ "New threat note found in Tucson shooting" NBC News, January 11, 2011. Retrieved January 23, 2014. ^ Williams, Mary Elizabeth (January 10, 2011). "The Giffords shooting's gay, Hispanic hero". Salon. ^ Morrison, Patt (January 10, 2011). "Two gay heroes thwart assassinations – what a difference 35 years make". Los Angeles Times. Archived from the original on January 12, 2011. Retrieved January 11, 2011. ^ "911 call: "I do believe Gabby Giffords was hit"". Abc15.com. January 9, 2011. Archived from the original on January 10, 2011. Retrieved January 11, 2011. ^ "Retired Guard Member Helps Subdue Arizona Gunman". American Forces Press Service. January 12, 2011. Archived from the original on July 13, 2013. Retrieved January 14, 2011. ^ Wendy Miller (January 12, 2011). "'Utter shock' -Area residents shaken but optimistic". The Explorer. Retrieved July 5, 2011. ^ a b "Giffords removed from respirator, has tracheotomy – Grocery store where shooting occurred reopens as Tucson". MSNBC. January 15, 2011. Retrieved July 5, 2011. ^ "Rep. Giffords shot, judge and 5 others killed at Tucson event". Arizona Daily Star. January 8, 2011. Retrieved January 11, 2011. ^ Belmaker, Genevieve Long; Belmaker, Gidon (January 8, 2011). "Gabrielle Giffords Survives Surgery, Doctors 'Optimistic'". The Epoch Times. Archived from the original on January 11, 2011. Retrieved January 11, 2011. ^ a b c d Gonzalez, Daniel (January 8, 2011). "Arizona Congresswoman Gabrielle Giffords: The victims". The Arizona Republic. Retrieved January 13, 2011. ^ Stanglin, Douglas (January 11, 2011). "Suspect Jared Loughner's parents 'devastated' by Tucson shootings". USA Today. Retrieved January 12, 2011. ^ "Family of Arizona Shooting Rampage Breaks Silence, Expresses Remorse for Victims". Fox News Channel. April 7, 2010. Retrieved January 12, 2011. ^ "The Arizona Shooting, and What Led Up to It", The New York Times. January 9, 2011. Retrieved January 30, 2011. ^ a b c d "Profile of Jared Loughner: 'I can't trust the current government'". MSNBC. January 8, 2011. Archived from the original on January 23, 2011. Retrieved January 8, 2011. ^ Rampton, Roberta (January 8, 2011). "Congresswoman Gabrielle Giffords shot in Arizona". Reuters. Retrieved January 8, 2011. ^ "Loughner Invoking Fifth Amendment After Arizona Slaughter". NewsTime. New Zealand. South African Press Association. January 9, 2011. Archived from the original on March 4, 2016. Retrieved January 9, 2011. ^ Nick Allen (January 10, 2011). "Gabrielle Giffords shooting: Jared Lee Loughner facing five charges". The Daily Telegraph. London. Archived from the original on January 20, 2011. Retrieved January 19, 2011. ^ Alexander Burns; Matt Negrin (January 9, 2011). "Federal charges could carry death penalty". Politico. ^ "Suspect charged in congresswoman's attack". MSNBC. Associated Press. January 9, 2011. ^ Tim Gaynor; Peter Henderson (January 9, 2011). "Suspect charged with attempted assassination of Giffords". Reuters. ^ "Arizona Suspected Gunman Passed FBI Background Check". Fox News. January 9, 2011. Retrieved 12 May 2013. ^ Riley, Michael (January 11, 2011). "Glock Pistol Sales Surge in Aftermath of Arizona Shootings". Bloomberg. Archived from the original on January 12, 2011. Retrieved January 11, 2011. ^ "Massacre suspect "mentally disturbed", former teacher says". CNN. January 10, 2011. Archived from the original on January 11, 2011. Retrieved January 14, 2011. ^ Perez, Evan (January 10, 2011). "Suspect Bought Bullets Hours Before Rampage". The Wall Street Journal. Archived from the original on January 25, 2011. Retrieved January 14, 2011. ^ Spotts, Pete. "Arizona shooting: Rep. Gabrielle Giffords hit at meeting with constituents". The Christian Science Monitor. Archived from the original on January 19, 2011. Retrieved January 8, 2011. ^ a b c d e f g h Lipton, Eric; Savage, Charlie; Shane, Scott (January 8, 2011). "Arizona Suspect's Recent Acts Offer Hints of Alienation". The New York Times. ISSN 0362-4331. Archived from the original on January 10, 2011. Retrieved January 10, 2011. ^ a b c d e Johnson, Kirk; Serge F. Kovaleski; Dan Frosch; Eric Lipton (January 9, 2011). "Jared L. Loughner's Odd Behavior Caused Alarm". The New York Times. ISSN 0362-4331. Archived from the original on December 29, 2011. Retrieved January 13, 2011. ^ a b Swaine, Jon (January 8, 2011). "Gabrielle Giffords shooting: strange internet trail of 'loner' Jared Lee Loughner, the alleged Tucson gunman". The Daily Telegraph. London. Archived from the original on January 19, 2011. Retrieved January 12, 2011. ^ Allen, Jonathan (January 6, 2012). "Gabrielle Giffords' future is up in the air a year after Tucson shooting". Politico. Retrieved January 15, 2012. ^ Emshwiller, John R.; Barrett, Devlin; Forrelle, Charles (January 10, 2011). "Suspect Fixated on Giffords". The Wall Street Journal. Archived from the original on January 10, 2011. Retrieved January 11, 2011. ^ Steller, Tim (January 8, 2011). "Man linked to Giffords shooting called 'very disturbed'". Arizona Daily Star. Archived from the original on January 9, 2011. Retrieved January 8, 2011. ^ Griffin, Drew; Yellin, Jessica; Candiotti, Susan; Bash, Dana; Rowlands, Ted; et al. (January 11, 2011). "Giffords stabilizes as suspect heads to court". CNN. Archived from the original on January 10, 2011. Retrieved January 11, 2011. ^ "Arizona massacre suspect: 'Kind of a troubled past'". CNN. January 9, 2011. Retrieved January 9, 2011. ^ a b Grinberg, Emanuella (January 8, 2011). "Witness: Arizona gunman 'was ready for war'". CNN. Archived from the original on January 12, 2011. Retrieved January 12, 2011. ^ "Loughner mused if he was a terrorist". United Press International. January 8, 2011. Archived from the original on January 19, 2011. Retrieved January 9, 2011. ^ Shafer, Jack; Tapper, Jake; Balko, Radley; Marshall, Josh; Smith, Ben; Kirn, Walter; Lithwick, Dahlia; Maddow, Rachel; Davis, Susan (January 8, 2011). "The Giffords Shooting". Slate. Archived from the original on January 19, 2011. ^ Weisenthal, Joe (January 8, 2011). "Gunman Identified As Jared Lee Loughner". Business Insider. Archived from the original on January 10, 2011. Retrieved January 8, 2011. ^ a b Banfield, Ashleigh; Jessica Hopper; Josey Crews; Emily Friedman (January 12, 2011). "Tucson Shooting: Jared Loughner Stopped for Traffic Violation Hours Before Shooting". ABC News. Archived from the original on January 19, 2011. Retrieved January 16, 2011. ^ Fox 11 (January 14, 2011). "Loughner's black bag found". KMSB-TV. Archived from the original on September 28, 2011. Retrieved January 16, 2011. ^ a b "Inmate Locator: Jared Lee Loughner". Federal Bureau of Prisons. Retrieved January 12, 2011. ^ "Tucson shooting suspect held without bail". KNXV-TV. January 9, 2011. Archived from the original on January 11, 2011. Retrieved January 12, 2011. ^ Johnson, Kevin (January 11, 2011). "In Loughner case, Ariz. federal judiciary considers recusal". USA Today. Retrieved January 12, 2011. ^ O'Neill, Ann (January 12, 2011). "Lawyer keeps even the most loathed criminals off death row". CNN. Archived from the original on November 9, 2012. Retrieved January 12, 2011. ^ Reilly, Ryan J. (January 12, 2011). "Due To Arizona Conflicts, California Judge Takes Over Loughner Case". Talking Points Memo. Retrieved January 13, 2011. ^ Hoffer, Steven (January 10, 2011). "Judy Clarke, Who Defended the 'Unabomber,' Will Represent Jared Lee Loughner". AOL News. AOL. Retrieved January 11, 2011. ^ William Glaberson (January 10, 2011). "Loughner's Lawyer Is Called a Master Strategist". The New York Times. Archived from the original on January 11, 2011. Retrieved January 11, 2011. ^ Riccardi, Nicholas (January 20, 2011). "Federal grand jury indicts Loughner in Giffords shooting". Los Angeles Times. Archived from the original on February 18, 2011. Retrieved January 20, 2011. ^ Cratty and, Carol (March 4, 2011). "Alleged Tucson gunman indicted on 49 charges in shooting". CNN. Retrieved March 5, 2011. ^ Smith, Kim (January 10, 2011). "LaWall considers state charges in Tucson shooting spree case". Arizona Daily Star. Retrieved January 11, 2011. ^ "Trial not likely for Jared Lee Loughner in 2012". New York Post. Associated Press. January 6, 2012. Retrieved July 16, 2012. ^ "U.S. judge grants more time for accused Tucson shooter". Reuters. February 6, 2012. Retrieved July 16, 2012. ^ "Jared Lee Loughner Loses 3 Appeals Over Forced Medication". Huffington Post. Associated Press. March 5, 2012. Retrieved July 16, 2012. ^ Jennifer, Bowen (May 24, 2012). "Hearing set to determine if alleged Tucson shooter can stand trial". Tucson News Now. Archived from the original on October 9, 2013. Retrieved July 16, 2012. ^ David, Schwartz (June 12, 2012). "Accused Tucson shooter's competency hearing rescheduled". Reuters. Retrieved July 16, 2012. ^ "Jared Loughner is found competent to stand trial". The Arizona Republic. Retrieved August 7, 2012. ^ Ball, James (November 8, 2012). "Jared Lee Loughner sentenced to life in prison". The Washington Post. Retrieved November 14, 2012. ^ Duke, Alan (November 9, 2012). "Loughner sentenced to life for Arizona shootings". CNN. Retrieved November 14, 2012. ^ Santos, Fernanda (November 8, 2012). "Gunman in Giffords Shooting Sentenced to 7 Life Terms". The New York Times. Retrieved November 14, 2012. ^ a b c d "Thumbnail sketches of victims in Tucson shooting". Boston Globe. Associated Press. January 9, 2011. Retrieved January 10, 2011. ^ "Gabrielle Giffords shooting: As it unfolded". The Arizona Republic. January 8, 2011. Retrieved January 9, 2011. ^ Dolnick, Sam; Lacey, Marc (January 13, 2011). "Tucson Pauses in Grief for the Youngest Victim". The New York Times. Archived from the original on January 14, 2011. Retrieved January 15, 2011. ^ Stephanie Innes (September 1, 2011). "Born, died between 2 tragedies". Arizona Daily Star. Retrieved September 1, 2011. ^ "'Baby of hope' shot dead by gunman". The Sydney Morning Herald. January 9, 2011. Retrieved January 9, 2011. ^ a b Berger, Joseph (January 9, 2011). "Born on Sept. 11, Claimed by a New Horror". The New York Times. ISSN 0362-4331. Archived from the original on January 19, 2011. Retrieved January 9, 2011. ^ Naman, Christine Pisera (2002). Faces of Hope: Babies Born on 9/11. Deerfield Beach, Florida: Health Communications, Inc. p. 41. ISBN 978-0-7573-0097-4. Retrieved January 10, 2011. ^ Posnanski, Joe (January 24, 2011). "A Death in The Family". Sports Illustrated. Retrieved January 22, 2011. Everyone says Christina had Roxanna's grace and John's spirit. ^ Rhonda Bodfield (January 10, 2011). "Morrises, shot at shopping center gathering, 'were totally in love'". Arizona Daily Star. Retrieved January 11, 2011. ^ John Schwartz (January 8, 2011). "Amid Shock, Recalling Judge's Life of Service". The New York Times. Archived from the original on November 13, 2012. Retrieved January 9, 2011. ^ Rhonda Bodfield (January 10, 2011). "Shooting victim made quilts, volunteered". Arizona Daily Star. Retrieved January 11, 2011. ^ Poole, Brad (January 11, 2011). "Tucson shooting victim shielded wife from hail of bullets". Reuters. Archived from the original on January 12, 2011. Retrieved January 12, 2011. ^ Davis, Tony (January 9, 2011). "Aide had gift for working with people". Arizona Daily Star. Retrieved January 11, 2011. ^ Jazmine Woodberry (2012-11-17). "Ex-Giffords aide Ron Barber wins Arizona House race". Reuters. Retrieved 2013-09-11. ^ Moos, Julie (January 8, 2011). "After conflicting reports in Arizona shooting, Sklar, Silverman track media mistakes while NPR explains". Poynter Institute. Archived from the original on January 10, 2011. Retrieved January 9, 2011. ^ Hagey, Keach (January 8, 2011). "NPR: 'We regret the erroneous news'". Politico. Retrieved January 9, 2011. ^ Williams, Mary Elizabeth (January 10, 2011). "The Giffords shooting's gay, Hispanic hero". Salon. Archived from the original on January 17, 2011. Retrieved January 15, 2011. ^ Morrison, Patt (January 10, 2011). "Two gay heroes thwart assassinations – what a difference 35 years make". Los Angeles Times. Archived from the original on January 14, 2011. Retrieved January 15, 2011. ^ Foley, Elise (January 10, 2011). "Heroic Giffords Intern Could Be Asked For Papers Under Arizona Immigration Law". Huffington Post. Archived from the original on January 11, 2011. Retrieved January 15, 2011. ^ Murray, Shailagh; Horwitz, Sari (January 9, 2011). "Hospital: Rep. Gabrielle Giffords shot in Tucson rampage; federal judge killed". The Washington Post. Retrieved January 9, 2011. ^ a b Gupta, Sanjay (January 10, 2011). "Gupta: What helped Giffords survive brain shot". CNN. Archived from the original on January 11, 2011. Retrieved January 13, 2011. ^ Stein, Rob; Vedantam, Shankar (January 9, 2011). "Doctors see signs of hope for Giffords's recovery". The Washington Post. Retrieved January 10, 2011. ^ Carollo, Kim (January 9, 2011). "Gabrielle Giffords in Medically Induced Coma to Help Brain Rest". ABC News. Archived from the original on January 19, 2011. Retrieved January 9, 2011. ^ Cooper, Helene; Zeleny, Jeff (January 12, 2011). "Obama Calls for a New Era of Civility in U.S. Politics". The New York Times. ISSN 0362-4331. Archived from the original on September 4, 2011. Retrieved January 12, 2011. ^ Money, Luke (January 14, 2011). "Giffords can move legs, begins physical therapy". Arizona Daily Wildcat. Archived from the original on January 17, 2011. Retrieved January 14, 2011. ^ Martinez, Michael (January 21, 2011). "Giffords arrives in Houston". CNN. Archived from the original on January 21, 2011. Retrieved January 21, 2011. ^ Cohen, Elizabeth (January 26, 2011). "Giffords moves to rehabilitation hospital". CNN. Retrieved January 26, 2011. ^ "Doctor: Giffords has 'great rehabilitation potential'". Arizona Daily Star. January 21, 2011. Retrieved January 22, 2011. ^ Landau, Elizabeth (January 11, 2011). "Giffords in key period after brain injury". CNN. Retrieved January 11, 2011. ^ "Giffords returns to House for debt vote". CNN. August 1, 2011. Retrieved August 1, 2011. ^ "Gabrielle Giffords to undergo 'intensive' therapy in North Carolina". CNN. October 23, 2011. Archived from the original on November 3, 2011. Retrieved November 18, 2011. ^ Myers, Amanda Lee; Price, Michelle (November 4, 2011). "AP Exclusive: Giffords vows return to Congress". Yahoo!. Associated Press. Retrieved November 18, 2011. ^ "Giffords to resign from Congress". Fox News Channel. January 22, 2012. Retrieved January 22, 2012. ^ Mascaro, Lisa (January 26, 2012). "Rep. Gabrielle Giffords sees her last bill pass, says farewell". Los Angeles Times. Retrieved January 26, 2012. ^ Lack, Eric (January 10, 2011). "Giffords Sent Email on Eve of Shooting Calling For Toned Down Rhetoric". Talking Points Memo. Retrieved January 11, 2011. ^ a b Carl Hulse; Kate Zernike (January 8, 2011). "Bloodshed Puts New Focus on Vitriol in Politics". The New York Times. Archived from the original on January 10, 2011. Retrieved January 8, 2011. ^ Coutsoukis, Photius (January 2011). "Screenshot of Sarah Palin's Facebook Page with the "Cross Hairs" Map". articlesurfing.org. Retrieved January 11, 2011. ^ Mark Preston (January 9, 2011). "Adviser: Linking Palin to shootings 'appalling'". CNN. Retrieved January 9, 2011. ^ Zeleny, Jeff; Shear, Michael D. (January 12, 2011). "Palin Joins Debate on Heated Speech With Words That Stir New Controversy". The New York Times. Archived from the original on January 13, 2011. Retrieved January 12, 2011. ^ "Palin says efforts to lay blame 'reprehensible' and a 'blood libel'". CNN. January 12, 2011. Archived from the original on January 12, 2011. Retrieved January 13, 2011. ^ "Palin Criticizes Manufacturers of 'Blood Libel' as Proponents of Speech Limits Cite Sharron Angle". Fox News Channel. April 7, 2010. Archived from the original on January 19, 2011. Retrieved January 13, 2011. ^ Steinhauer, Jennifer (January 9, 2011). "Shooting Casts a Harsh Spotlight on Arizona's Unique Politics". The New York Times. Retrieved January 10, 2011. ^ Sandhya Somashekhar (January 9, 2011). "Sheriff Dupnik's criticism of political 'vitriol' resonates with public". The Washington Post. Retrieved January 29, 2011. ^ Mirkinson, Jack (January 9, 2011). "Megyn Kelly Debates Sheriff Clarence Dupnik About His Comments on Arizona Shooting (VIDEO)". Huffington Post. Retrieved January 12, 2011. ^ "Shot US congresswoman Gabrielle Giffords 'doing well'". BBC News. January 9, 2011. Archived from the original on January 10, 2011. Retrieved January 11, 2011. ^ "Toestand Giffords bevredigend (Condition Giffords satisfying)". nos.nl (Dutch public broadcaster) (in Dutch). Retrieved January 11, 2011. ^ "Tea Party: links misbruikt aanslag (Tea Party: left misuses attack)". RTL News (Dutch commercial broadcaster) (in Dutch). Retrieved January 11, 2011. ^ "Amerikaans Congreslid Giffords neergeschoten (American member of congress Giffords shot down)". deredachtie.be (VRT; Belgian public broadcaster) (in Dutch). Retrieved January 11, 2011. ^ "US-Abgeordnete Giffords in kritischem Zustand (US-representative Giffords in critical condition)". tagesschau.de (ARD; German public broadcaster) (in German). Archived from the original on January 11, 2011. Retrieved January 11, 2011. ^ "Global worry: Tucson attack augur more violent US?". Fox News Channel. Associated Press. January 10, 2011. Archived from the original on January 23, 2011. Retrieved January 15, 2011. In Paris, the newspaper Le Monde said the attack seemed to confirm "an alarming premonition that has been gaining momentum for a long time: that the verbal and symbolic violence that the most radical right-wing opponents have used in their clash with the Obama administration would at some point lead to tragic physical violence." ^ Obama, Barack (January 8, 2011). "The President's Statement on the Attack in Arizona". The White House. Archived from the original on January 12, 2011. Retrieved January 13, 2011. This morning, in an unspeakable tragedy, a number of Americans were shot in Tucson, Arizona, at a constituent meeting with Congresswoman Gabrielle Giffords. And while we are continuing to receive information, we know that some have passed away, and that Representative Giffords is gravely wounded. We do not yet have all the answers. What we do know is that such a senseless and terrible act of violence has no place in a free society. I ask all Americans to join me and Michelle in keeping Representative Giffords, the victims of this tragedy, and their families in our prayers. ^ "Arizona Congresswoman Gabrielle Giffords shot: reaction". The Arizona Republic. January 8, 2011. Retrieved January 13, 2011. ^ "Boehner Condemns Attack on Congresswoman Gabrielle Giffords" (Press release). John Boehner. Archived from the original on January 8, 2011. Retrieved January 9, 2011. ^ "Statement from Chief Justice Roberts on Death of Judge Roll". Fox News Channel. January 8, 2011. Archived from the original (AJAX) on May 24, 2012. Retrieved January 10, 2011. ^ Mike Sunnucks (January 8, 2011). "Arizona, federal leaders speak out on shootings". Phoenix Business Journal. Retrieved January 8, 2011. ^ "McCain: Shooting a 'terrible, terrible' tragedy". Ynetnews. Israel News. January 9, 2011. Retrieved January 29, 2011. ^ a b "In quotes: Reaction to Arizona shooting". BBC News. January 9, 2011. Archived from the original on January 10, 2011. Retrieved January 9, 2011. ^ "Ottawa offers condolences to 'valued friend' after Arizona shooting". The Globe and Mail. Toronto. January 9, 2011. Archived from the original on January 20, 2011. Retrieved January 10, 2011. ^ "Expresa Rodríguez Zapatero a Obama su solidaridad tras atentado". yucatan.com.mx (in Spanish). Grupo Megamedia. January 9, 2011. Archived from the original on May 24, 2012. Retrieved January 11, 2011. ^ "Fidel Castro Condemns Attack on U .S. Congresswoman". Fox News Channel. Associated Press. January 9, 2011. Archived from the original on January 24, 2011. Retrieved January 9, 2011. ^ Parkinson, John R. (January 11, 2011). "Top Republican Rep. Pete King to Introduce Gun-Control Legislation". ABC News. Retrieved January 12, 2011. ^ Chernoff, Allan (January 12, 2011). "McCarthy to call for ban on high-capacity ammo clips". CNN. Archived from the original on November 9, 2012. Retrieved January 12, 2011. ^ Kurtz, Howard (January 8, 2011). "Should We Blame Sarah Palin for Gabrielle Giffords' Shooting?". The Daily Beast. Archived from the original on January 10, 2011. Retrieved January 9, 2011. ^ Byron York (January 9, 2011). "Journalists urged caution after Ft. Hood, now race to blame Palin after Arizona shootings". The Washington Examiner. Archived from the original on January 28, 2011. Retrieved January 9, 2011. ^ Robert Stacy McCain. "Arizona Shootings: 'It Was a Colossal Failure of Journalism'". The American Spectator. Archived from the original on August 27, 2013. Retrieved January 9, 2011. ^ Krugman, Paul (January 9, 2011). "Climate of Hate". The New York Times. Archived from the original on January 13, 2011. Retrieved January 13, 2011. ^ a b Olbermann, Keith (January 8, 2011). "Keith Olbermann Issues Special Comment on Arizona Shooting: 'Violence Has No Place In Democracy'". Huffington Post. Archived from the original on January 17, 2011. Retrieved January 15, 2011. ^ Minora, Leslie (January 9, 2011). "Keith Olbermann Calls Out Conservatives for Inciting Tucson Shooting, Includes Allen West, Repents". Broward/Palm Beach New Times. New Times BPB. Archived from the original on January 13, 2011. Retrieved January 15, 2011. ^ a b Estes, Adam Clark (January 11, 2011). "Jon Stewart on shooting: No idea how to process this". Salon. Retrieved January 15, 2011. ^ "Flags ordered at half-staff through Saturday in honor of Tucson shooting victims". Herald Times Reporter. Archived from the original on September 24, 2015. Retrieved January 20, 2011. ^ Camia, Catalina (January 10, 2011). "Moment of silence observed on Capitol steps". USA Today. Gannett Co. Inc. Retrieved January 13, 2011. ^ Obama, Barack (January 12, 2011). "Obama's Remarks in Tucson". The New York Times. ISSN 0362-4331. Retrieved January 13, 2011. ^ Powers, Ashley (November 10, 2011). "Former Giffords intern elected to Arizona school board". Los Angeles Times. Retrieved November 25, 2011. ^ "Bipartisan State of Union Seating Urged By Sen. Mark Udall". NPR. January 13, 2011. ^ Stephanie Innes, Christina-Taylor Green: Born, died between 2 tragedies, Arizona Daily Star (January 9, 2011). ^ a b Board of Trustees meets; President Spanier's remarks, Penn State University (March 18, 2011). ^ Joseph Berger, Born on Sept. 11, Claimed by a New Horror, New York Times (January 9, 2011). ^ Mehta, Seema (January 11, 2011). "Tucson rallies to protect girl's family from protesters". Los Angeles Times. ^ "Bill Would Ban Westboro Picketers at Christina Green's Tucson Funeral". Politics Daily. January 11, 2011. ^ "Tucson Shooting Victim Detained at Taping of TV Special". MSNBC. January 16, 2011. Archived from the original on January 19, 2011. Retrieved January 19, 2011. ^ "Ariz. Shooting Victim Apologizes for Outburst". CBS News. January 17, 2011. Archived from the original on January 19, 2011. Retrieved January 19, 2011. Indictment. U.S. District Court of Arizona. January 19, 2011. "Arizona Shooting collected news and commentary". The New York Times. "Rampage in Arizona, January 2011 (slideshow)". Life. January 8, 2011. "A Statement from U.S. Representative Gabrielle Giffords' Chief of Staff, Pia Carusone". Gabrielle Giffords official website (archived). January 9, 2011.